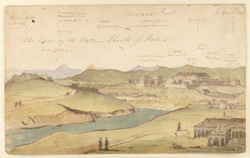 Pen-and-ink and water-colour sketch of Madikeri by an unknown artist, c.1840. On the back is an unfinished portrait sketch. Inscribed on the front in ink is: 'Mercara Fort; The line of the Western Ghauts of India'; also notes on various buildings and hills. Mercara or Madikeri is situated in southern Karnataka (formerly Mysore), southern India in the Western Ghats at an elevation of 3,800 feet (1,160 metres). The Lingayat Rajas ruled over the area from 1600 onwards and established their capital at Madikeri where they built a mud fort. The fort is set on a rocky outcrop surrounded by hills. It is roughly hexagon in shape set behind a ditch with a sloping bank to the north face. In the 1770s and 1780s the fort was attacked by Haidar Ali and Tipu Sultan. In 1791 the fort was overwhelmed by Vira Raja of Coorg (Kodagu). The British excluded Tipu from the area by the treaty of Seringapatam (1792) and Vira Raja was restored to power. Later the subjects of Vira Raja complained of their ill treatment and sought British protection which was secured by the unopposed annexation of Coorg in 1834.